Nearly 30k people nominated the brands preferred by them in the only user ranking in the country, which was organised over the course of two months. Users voted in three stages, identifying the leaders in 39 categories. The initiative is an expression of consumer preferences towards certain brands in different sectors. And it is not an expression of preferences only, but of a real emotional attachment to specific brands, which we would miss if they disappeared. Favourite brands are selected only through voting by end-users who strongly supported Krasi in all three rounds of the competition and ultimately gave their vote with a serious lead for “The best mayonnaise”. This is a high praise for the brand by consumers in the “Favourite Brand” for a third consecutive year. 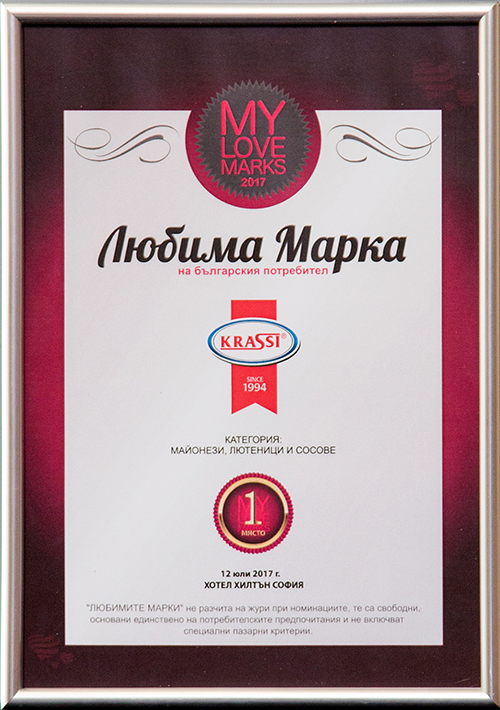 Krasi mayonnaise is the best-selling product in its market segment in the country, and over the years has won awards like Superbrands, gold medals from the Plovdiv International Fair, etc. Few are products that remain of high quality for many years, and consumers continue to trust them.